Find out about the major changes in the names and attributes of the schemes belonging to ICICI Pru MF. Almost every mutual fund house is busy making changes in its schemes to comply with SEBI’s new re-categorization norms. ICICI Prudential AMC has recently taken charge and changed names and fundamental attributes of its several schemes to comply with the new re-categorization standards for mutual funds. This move by the regulatory body will help in making investment in mutual funds simpler for investors. As per the new rules, a particular fund house can only have one mutual fund under a specific category. This rule affected ICICI Pru mutual funds as well, thus leading to name change, merging, and re-categorization in some of its schemes. 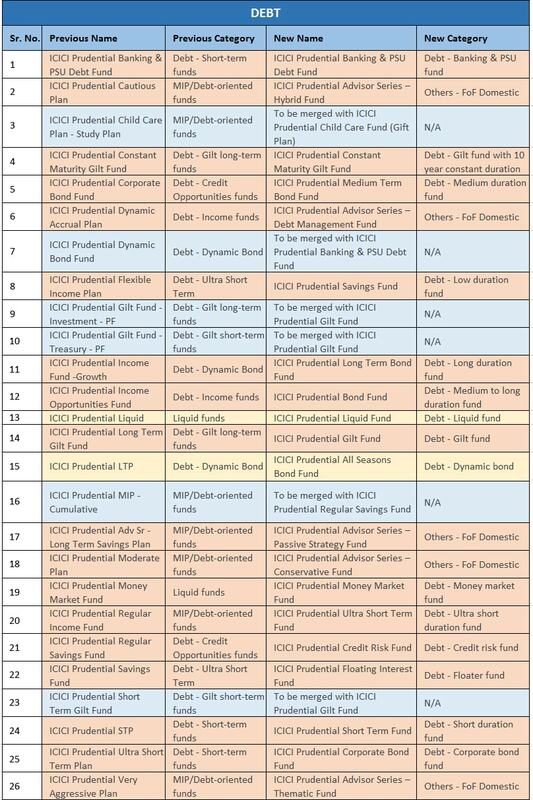 ICICI Dynamic Plan of ICICI Prudential Mutual Fund has been re-categorized as a multi-asset fund. 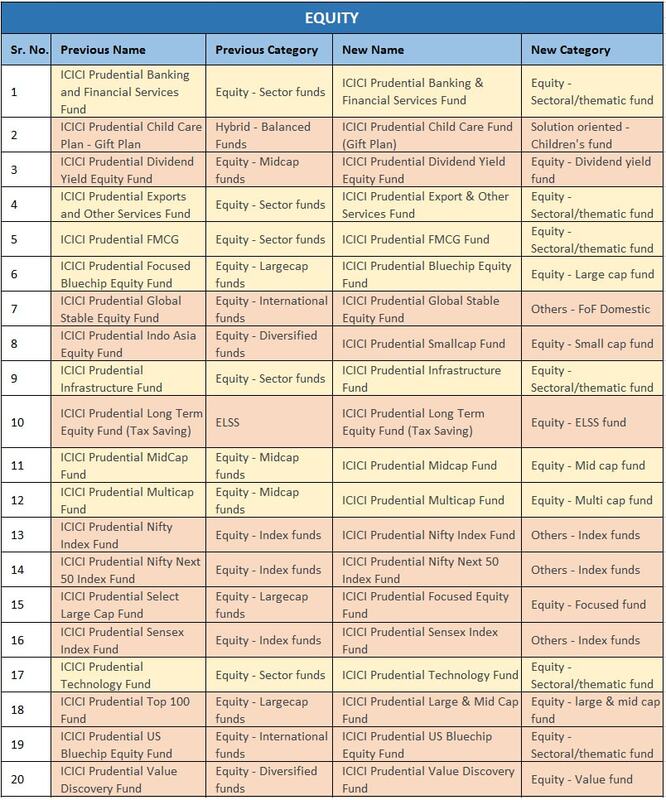 Its new name is ICICI Prudential Multi-Asset Fund. It was a multi-cap fund that invests across market capitalization. After the re-categorization, the scheme will have its investment in multiple assets including equity, debt, gold, etc. According to our experts, you should stay invested in the new scheme in case you have plans to diversify into multi-asset schemes. You can also prefer investing the extra money in a new multi-cap scheme. This way, you can save on the taxes. With the change in the fundamental attributes of ICICI Prudential Focused Bluechip Equity Fund to comply with SEBI’s re-categorization norms, the scheme will be renamed as ICICI Prudential Bluechip Fund. This change will be effective from May 28, 2018. The scheme particularly invests in equity and equity-related securities of about 20 companies belonging to the large-cap and the remaining in debt and money market instruments. After complying the changes, it will invest minimum 80 percent of the corpus in equity and equity-related securities falling in the large-cap domain. The remaining will be invested elsewhere(debt and money-market securities). Our experts believe that technically there is hardly any change in this scheme except for its name. One must consider the scheme’s winning performance record before deciding to leave this scheme. Being a less aggressive fund and the one which aims to deliver returns which are two-three percent above Nifty returns, the fund has been doing very well. Do you have an investment in any of the above-listed schemes? Here’s what you should do. In case of a change in category and name of the scheme If you’ve invested in a scheme whose category and name has experienced a change, then it’s time you should consider to bring a change in your investment strategy too. These changes can bring a major effect in the funds which particularly fall in the equity class. Considering debt funds, they will not feel much disruption in their investment style. In case of merging of schemes If your mutual fund scheme has merged with some other scheme, then relax as this not something you need to worry about; your AMC will take care of the merger. Talking about the change it can bring, there will be no significant amendments as the merging will take place within the category. This states that you being an investor, don’t need to make any change in your investment strategy. In case when only the name is changed If only the name of your ICICI Pru mutual fund scheme has experienced a change, then there is no need to be concerned or do anything. Simply continue with your investment. Being an investor in any of the above-listed schemes if you are still confused, then it’s time to contact our experts at MySIPonline to seek advice on this issue.